Special thanks goes to all our partners for making our first edition of CONSCIOUS LOFT BERLIN so exceptional. 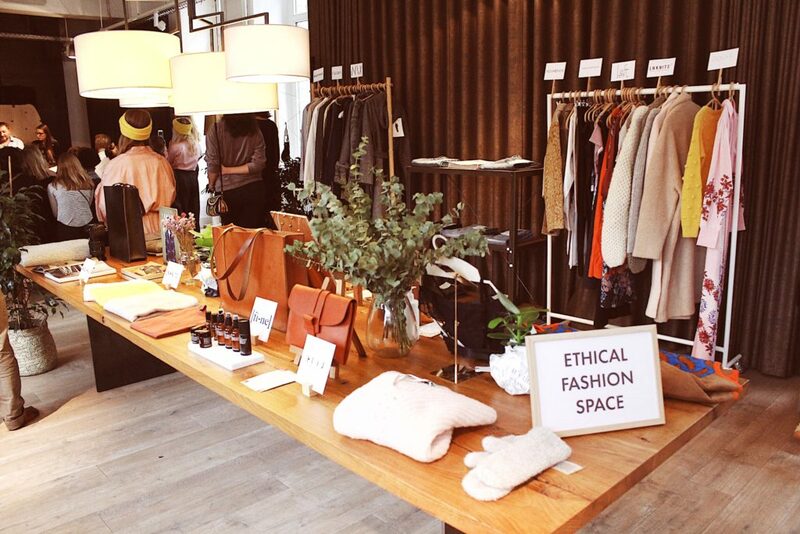 We´re grateful for the amazing experience and time we had during the launch of our 1st Edition of CONSCIOUS LOFT in Berlin during Fashion Week, 15-17 January 2019. Around 300 conscious fashion, clean beauty & sustainable lifestyle enthusiasts from all over the world gathered in our 250sqm conscious loft apartment in the district of Kreuzberg to discuss, connect, and get to hear cutting-edge panels with 24 experts from companies such as PETA Germany, Fairtrade Germany, and the Conscious Campaign supported by the UN, hosted by Kestrel Jenkins from California. Thanks to international press such as VOGUE.DE, Harpers Bazaar Korea, Grazia Korea, Blonde, Nylon, and diverse international ethical bloggers for joining us. Much appreciation goes to our partner PREMIUM GROUP who supported us with our own 25.000€ fashion stand at the PREMIUM trade show to promote sustainable fashion. Stylish sportswear for women fairly produced in Germany. From leggings to tank tops and colorful t-shirts – all pieces are made from recycled polyester. The Öko Tex 100 certified material is functional, long-lasting, vegan and super soft! We love their colorful prints. Are you ready to fight fast fashion? The German womens– and menswear label thinks organically, believes in fairness and loves the timeless design. ARMEDANGELS uses materials that are GOTS-, Fairtrade-, PETA-, and Fair Wear Foundation-certified. Because taking responsibility and protecting our environment is not an option but a must. The sustainable fashion brand from Kiev offers minimalistic pieces that can be worn season after season. All clothes are made from premium deadstock fabric and are ethically produced in the Ukraine. Designer Buki Akomolafe combines her German/Nigerian roots into her high-end clothing for women and men. Precise cuts, flashy colors and an androgynous touch make her collections outstanding. Handmade in a small atelier in Berlin using eco-friendly materials. Chilote Shoes quipped us with 18 pairs of house shoes for our guests. Super comfy and warm Patagonian sheep wool slippers with durable upcycled salmon leather handmade by empowered independent artisan women in rural Patagonia. BCorp certified & climate positive, A’ Design Award and Core77 Design Award winner. German-Swiss designer Imke Disselhoff creates environmentally-friendly luxury handbags for the fashion-conscious woman. Disselhoff exclusively uses hides from animals that have been kept under the strict ‘Biokreis’ guidelines. DOU.K equipped our team with custom-made pajama shirts. DOU.K creates custom-made shirts for the perfect fit. Timeless & elegant, transparent & sustainable for women and men. Based in NYC and Paris, the studio works closely with renowned mills in Europe and a family-owned workshop in Poland. Folkdays is a fair fashion brand that combines high-quality materials, craftsmanship with fair working conditions in developing countries. Folkdays travels around the world to find artisans and buy products directly from them at a fair price. They only use natural materials such as silk, cashmere or baby alpaca of the highest quality. Folkdays equipped our team with black silk pants and our beauty experts with pink silk kimonos. HIITU offers unique leather accessories, jewelry, and clothing handcrafted by the most skilled artisans and manufacturers around the world. Only natural materials such as vegetable-tanned leather from Italy or cotton made in Africa (CmiA) are used. The PETA-approved womenswear label combines ecological and flawless materials with fair working conditions, feminine designs and clear silhouettes. “Love fashion, think organic and be responsible” is what LANIUS stands for. PETA-approved and GOTS-certified. Inspired by their need for more fashion-forward garments that are sustainable, stylish & affordable, the two power women Holly & Kestrel started Left Edit. Vibrant colors meet custom-designed prints and eco-friendly materials that are ethically produced. Made locally in the USA. Founded by a girl power trio, LEIT & HELD from Zürich and Berlin aims to create beautiful leather goods with the strongest commitment to sustainability. For their unique bags, they use the most environmental-friendly and innovative vegetable-tanning methods we have nowadays. With every piece from the Belgian Alpaca knitwear label LN KNITS, you support talented Peruvian ladies who hand-knit stylish cardigans, beanies, sweaters, scarves and more under the best human conditions in Peru. All pieces are entirely made from 100% baby alpaca wool which is one of the softest, most delicate and greenest fibers on earth. Fair and stylish eco-fashion from Germany. Feminine styles with androgynous cuts: LOVJOI presents 4 collections a year boasting casual streetwear as well as contemporary pieces for special occasions. Made-to-order. 100% GOTS certified. What´s new: The Lovjoi Intimates collection made from non-toxic materials. Nix Design is a Berlin-based sustainable fashion label for the urban woman, founded by Designer Barbara Gebhardt. Her fashionable yet casual styles are made in the highest sustainable quality and her first patterns are sewn in her own atelier in Berlin. All materials are GOTS-certified. The small collection is ethically manufactured in a small factory in Poland. 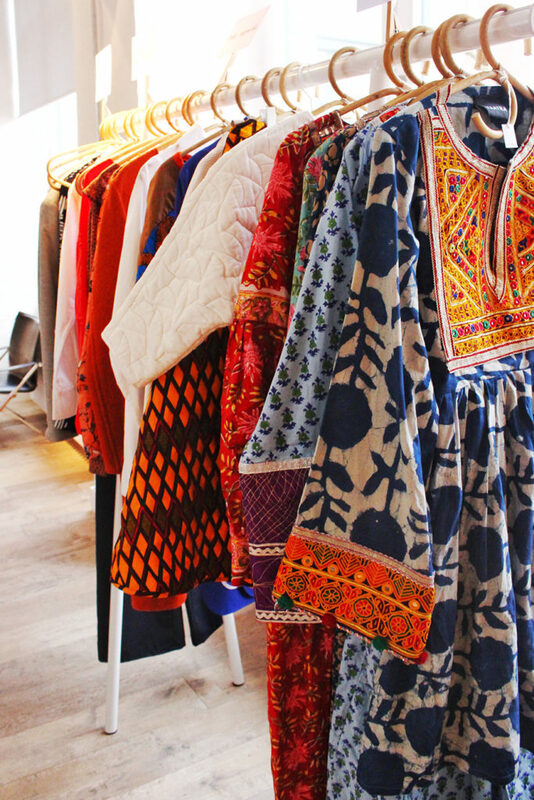 We exceptionally love her eco-friendly flagship store in Berlin Mitte. The PETA-approved fashion brand from Amsterdam offers retro-infused designs inspired by bold female activists from the 70s. Their “From Couch to Coat Collection” boasts blazers & jackets from surplus furniture fabric. Entirely cruelty-free & eco-friendly, from cut to finish. RHUMAA partners with different artists who create original designs that are based on impactful stories they experienced. For each item sold, RHUMAA donates a portion to projects, people and art. High-quality natural fabrics only – vegan styles available. Thokk Thokk equipped our team with white organic cotton t-shirts. Together with the Indian NGO called SAVE, the fair fashion label fights child labor in the textile industry and supports women’s and workers’ rights. The simple pieces are made from sustainable fabrics such as organic cotton. Toms equipped our team with vegan shoes made from linen. The shoe company helps improve lives in over 70 countries in the world by providing clean water, health, education and more. With every pair you get, a new pair of Toms shoes will be provided to a child in need. Designed in Cologne, inspired & made by women under fair conditions in India: Yaatra wishes to share colorful unique pieces with women all over the world. Beautiful kimonos and dresses – each of them is one of a kind. An ancient and all natural form of oral hygiene which you can use in aid of floss, toothpaste and the brush head itself. The “branch brush” is called Miswak and comes from the Salvadoran tree root which has effective health properties recognized by the World Health Organization. FINE deodorant is pure, organic and effective. Carefully selected ingredients ensure a fresh feeling and a great smell that last the entire day. 100% free of aluminium salts and sustainably packaged! We love their new minty stick deodorant. A transparent luxury beauty company you can trust and love. Impurity-free makeup using naturally derived ingredients only. Without artificial colorants & fragrances or preservatives. Environmentally-friendly, ethical and 100% animal cruelty-free, of course. Available on savuebeauty.com. The transparent beauty line uses natural & organic ingredients as a base and partly safe synthetics to ensure the product’s best performance. The product range consists of foundations available in various shades, high pigment lipsticks in different colors and more. Availanle on amazingy.com. The luxury skincare brand offers proven-effective solutions based on native Moroccan and organic ingredients of the highest quality. Almost all the products contain precious Argan oil ethically extracted by women in Morocco. Available on amazingy.com. Sustainable skincare for women and men tested by skin care professionals. Cleanse, balance, and nourish your sensitive skin with the Gentle Cleanser, Refreshing Toner, and Calming Moisturiser. Each product contains the best carefully sourced ingredients. The beauty award-winning makeup line founded by New York-based makeup artist Kjaer Weis is made with Certified Natural or Certified Organic ingredients that reach the standards of luxury beauty. Made in Italy. Available on amazingy.com. The original and world’s best konjac sponge deep-cleanses, exfoliates and refines your skin. The vegetable fiber sponges from Korea are 100% natural, 100% vegan and entirely made by hand. Gentle enough for baby skin! Available on amazingy.com. Naïf skincare and babycare is made from natural ingredients, without any harmful substances. That’s why Naïf products are especially great for babies, kids, and very sensitive skin. 100% plant-based and cruelty-free. Made in the Netherlands. Fresh, fresher, NUORI: the Danish fresh cosmetics brand uses 100% natural and plant-based ingredients such as aloe vera, avocado oil or apple fruit water. Absolutely free of artificial preservatives and other synthetic additives. Renowned hair stylist and colorist Fabian Lliguin & Anna Ayers from NYC created the sustainable hair care brand after discovering that women in the Amazon area use this special oil to keep their hair healthy. Rahua creates healthy, gorgeous results and honors sustainable, traditional methods in the Amazon Rainforest. Today, Rahua is known for its pure ingredients and unparalleled performance. The certified organic beauty product line from Sweden supports the slow beauty movement. Each product is freshly produced and individually poured by hand. Amazing highlighters and colors for lips, eyes & cheeks. 100% vegan. The interior brand from Hamburg believes that every home should have a story to tell. Lilla Souk offers fairly handcrafted and sustainable products from all over the world including beautiful Moroccan carpets or stylish Danish cotton velvet pillows. Sika-Design equipped our loft and trade show stand with beautiful sustainable furtniture. Sika-Design from Denmark creates handmade furniture since its inception back in 1950. Arne Jacobsen, Franco Albini, and Nanna Ditzel are among their iconic designers. Sustainable high-quality items are popular all over the world. Tine K equipped out loft and fashion stand with iron racks and beautiful decoration. The Danish interior brand with a wide collection of furniture, lighting, and textiles. Created with Scandinavian simplicity in mind, the interiors mainly use either natural or sustainable materials, such as cotton, bamboo, rattan or reused aluminum. The multi-award-winning French chef and successful London restaurateur Alexis Gauthier started this vegan online shop and catering service. All products are 100% organic and made only with the best ingredients. We enjoyed their delicious granola with cashew milk as well as veggie cake, chocolate pralines and vegan brownies. California dreamin’ in Berlin: the two German sisters produce cold-pressed juices from certified organic and seasonal ingredients. We teamed up with LA Cold Press and poured out cold-pressed juices and rose water in our loft for the extra portion of energy! Nespresso, what else!? The answer is UniCaps! Save time and enjoy organic premium coffee and tea from capsules made of renewable raw materials. 100% free of aluminum and plastic! Suitable for all Nespresso® and NESCAFÉ® Dolce Gusto® machines. BWT is Europe’s leading company in water technology. The company from Austria turns hard tap water into silky-soft pearl water. Soft water makes textiles last longer and is better for the skin & hair as it is more hydrating. BWT sponsored us 5 of their water filters for magnesium mineralized tap water. Einhorn means unicorn in English. True to its name, their vegan condoms are fantastic: perfectly lubricated and perfectly sensual because of their bell-shape. We love their “fairstainable” practices just as much as their fun messages on each condom wrapper. We gave away Einhorn vegan condoms to all our guests. A practical alternative to plastic wrap: Gaia Wrap is a natural and reusable cling film made from cotton, beeswax, jojoba oil, and tree resin. The wax protects against bacteria, the oil against mold and UV radiation. Produced by hand in Hamburg. Change the game with this soft, allergy- and eco-friendly silicone menstrual cup. Wear it for hours, keep it for years, feel fresh, lower your TSS risk, save time, money and waste and protect the environment. Lulu Guldsmeden Berlin hosted the MOCHNI team. The new eco-friendly Hotel in Berlin belongs to the Danish, family-owned Guldsmeden group of 10 nouveau-bohême boutique hotels with a strong focus on sustainability. We think Lulu Guldsmeden is the coolest eco hotel in Berlin. 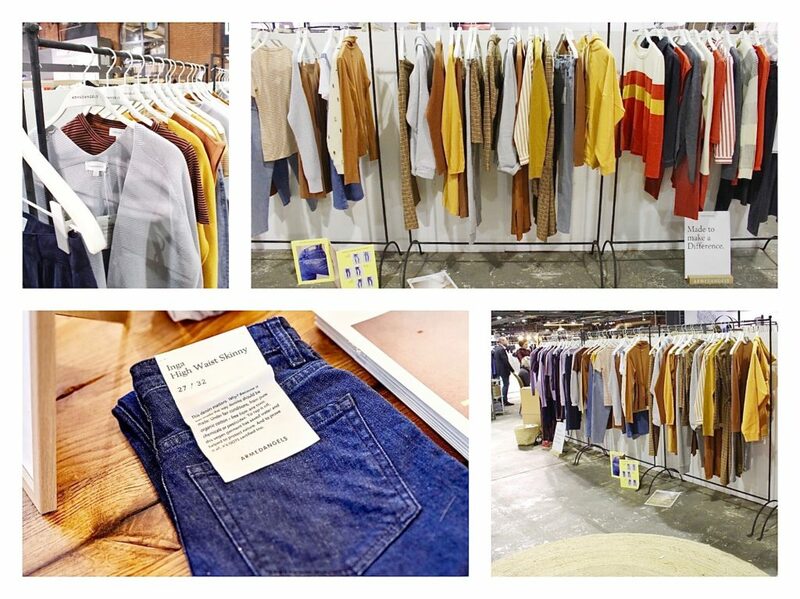 PREMIUM is one of the biggest trade shows for contemporary womens– and menswear. Their fashion trade show defines new industry trends. This fall-winter 19/20 season was the first time that we presented a joint stand with Armedangels, Disselhoff, LANIUS, LN Knits, LOVJOI, NIX Design. This sustainable fashion stand was powered by MOCHNI and supported by PREMIUM. For a phone call, please schedule an appointment.